‘Oh look, here he comes!’ My friend nudged my arm with her elbow and my backpack strap slid off my shoulder. I grabbed at it as I turned to look at who she was speaking of. Yup, there he was. The best looking guy in my history class, riding his skateboard, doing his crazy stunts on the way to school. He was the only other person in my neighborhood (besides my best friend who was walking beside me) who was taking summer college classes. And everyday on the way to the community college, he’d zoom past us on his skateboard as if he was riding wind. He was polite, kind, had a voice like Zac Efron and was a Christian. I mean, what more was needed? ‘Hi!’ my friend called back, cheerfully. She was basically a fan of his and had this huge crush on him. Actually...I think every girl in class did. ‘Hey,’ I said, with a smile. ‘Oh okay. Well, hope to see you guys - uh, gals,’ he winked. ‘there!’ And with two pushes of his foot on the hard pavement, he was off again. ‘Oh please,’ she said, annoyingly and quickened her steps. She reached the college sliding doors before I did and huffed off to her first class. I sighed. Great way to start the day. Classes seemed to go by pretty quick. By the end of the day, part of me was happy to have another summer college day behind me. The other half was disappointed. I wouldn’t be able to go to Matt’s party that evening because my history teacher had assigned me extra work. ‘Darn,’ I had muttered under my breath when she had handed me three more papers than usual. All thoughts and hopes of going to the party flew out the open classroom window. After quickly stuffing my books and folders into my backpack, I hurriedly stole outside before my friend could find me. She’d probably want to carpool, and I honestly didn’t want to tell her I wasn’t going. My long legs were an asset to me in walking quickly away from the college campus. Students were milling about, heading home or elsewhere. I heard the words ‘Matt’ and ‘party’ as I passed one group of kids, and it only made me walk faster. I was a couple blocks from home, engrossed in my pity partying thoughts, when two guys who were bicycling on the sidewalk, headed directly towards me. I thought they would move to one side, but instead, as they came closer, I realized they were expecting me to move. The next few seconds happened in a blur as I quickly jumped to the side and felt a pop in my ankle as my foot slipped off the edge of the sidewalk and onto the street. I landed on my backpack, which only hurt more because one of my kind college book corners poked my shoulder. I heard myself gasp and then lay in stunned silence for a few seconds. ‘Hey! What the heck do you think you’re doing?’ I heard someone yell. I looked up and back in the direction I had been walking from and saw him. He gestured frustratingly at the who bicyclists, then skated over to me. I tried to get up, but a little scream echoed from my lips and I fell back to the ground, wincing in pain. ‘Idiots,’ I heard him say, as he stopped short and flipped his skateboard up. ‘Hey, hey, stay down,’ he said, gently pushing my shoulder. ‘I need to get off the side of the street,’ I insisted, a little too much annoyance in my voice. ‘I don’t know what they were thinking!’ I said, tears of frustration welling in my eyes. The pain wasn’t helping either. ‘Let me see it.’ He gently took the shoe off my left foot and put his fingers against my ankle. ‘Does this hurt?’ he asked, applying pressure. I nodded, biting my lip. I grabbed onto his hand and he helped me get up. I put all my weight on my uninjured foot, holding the other one up off the ground. 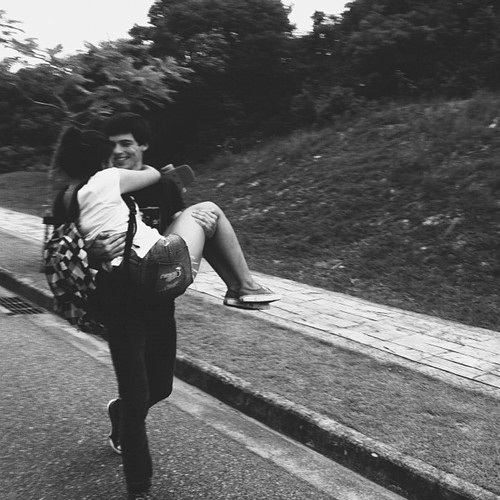 ‘Can you hold my skateboard?’ he asked. And the next thing I knew, I was in his arms. One hand gripped his skateboard and the other held tightly around his neck. ‘What are you doing?’ I exclaimed. ‘How do you know where I live?’ I asked him, as he started walking. He carried me as if I was as light as a feather. ‘Um, cuz I’ve skated passed your house before...’ he let the end sentence kind of dangle in midair. ‘And nothing,’ he chuckled, shifting me a bit in his arms. He laughed again. ‘No! Not at all. I workout.’ He winked at me. I smiled back. ‘Thank you so much for doing this. Are - oh my gosh, the party! You’re gonna be late for the party!’ I wriggled a bit and he clutched my waist and legs tighter. ‘I am so, so sorry!’ I said, my eyebrows knitting together in a worried frown. We had reached my house by then and he carefully walked up the front porch steps. I fished for the key in my pocket and pushed open the front door. He gently set me on the couch and proceeded to get a package of ice from the freezer and the first aid kit from the guest bathroom. I felt like I had my own personal nurse. And it just so happened to be him. The best-looking guy in my summer college history class. The guy all the girls wanted. The guy my friend crushed on. And here he was...bandaging my sprained ankle. ‘Thank you so much,’ I said, when he had finished. ‘Looks like a professionally done job.’ I lifted it a little. ‘Okay,’ I nodded, not being able to think of anything else to say. Whoopee for me. Lots of homework and a stupid sprained ankle. ‘Well, I should get going,’ he said, picking up his skateboard that I had carelessly discarded on the floor. Again, I felt horrible. ‘Thanks again. I’ll see you later.’ I smiled. ‘Sure thing!’ he waved, and then, was gone. I sat there for a few moments, thinking over the past half hour’s events. I don’t think I had ever felt so cared for and respected before. I gave a small shrug, bringing myself back to the present. My hair had fallen out of its bun during the havoc and I quickly tied it up again. I reached for my backpack and pulled out the extra homework Mrs. Smith had given me. Might as well try to keep my mind off of the fun everyone was having at Matt’s. ‘Dang it,’ I muttered. ‘Who is it?’ I hollered. No answer. Just another ring of the doorbell. It was him. With a handful of flowers, a large backpack over one arm and a plate of chocolate chip cookies. ‘What are you doing back so soon?’ I asked, my eyes wide with shock. ‘Well, you see,’ he began, in an almost theatrical voice as he set the cookies on the coffee table, then went to the kitchen for a vase. He was back in a few seconds, the flowers happily situated in some water. He continued, ‘Mrs. Smith just so happened to give me some extra homework too. And when I happened upon you, the injured maiden, I was actually on my way home - to work on school, not get something and then go to Matt’s. But since you didn’t know that, I just thought I’d pop on back with a few get well wishes and help you out with homework. It is rather dull doing history alone, you know?’ He winked again. He shrugged. ‘I get told that a lot. Mind if I sit?’ He motioned to the couch seat next to me. ‘No! Not at all.’ I lifted my leg and turned a little so it was resting on the table instead of the sofa. He plopped himself next to me. My nose caught a whiff of his cologne and I wished he’d sit closer. We both pulled out our homework assignments and for the next hour or so, were partially busy writing out our lessons or keeping each other sane by cracking jokes or telling funny stories. ‘I’m glad I came here instead of going to some ol’ party,’ he said, quietly. My laugh faded, after one of his practical jokes, and I turned my head to look at him. I could tell he was being sincere. ‘I’m glad you did too,’ I smiled. He paused a second, as if hesitant, then reached an arm around my shoulders. I scooted a little closer so I was situated just perfectly in the crook of his arm. OMW! I was holding my breath the whole time! Amazingly written! I love your stories!